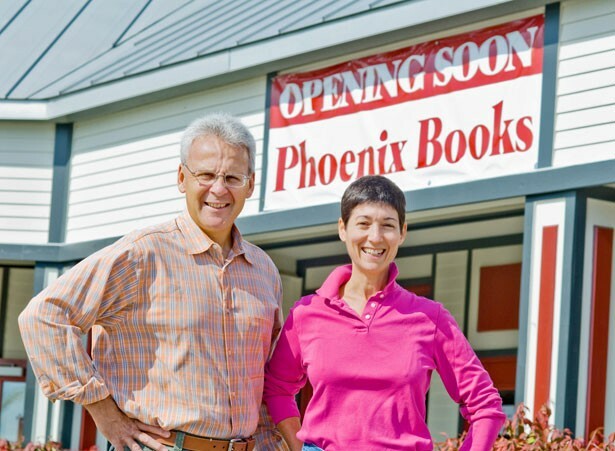 When Michael DeSanto and Renée Reiner announced their plans to open Phoenix Books in the Essex Shoppes and Cinema later this month, the headline was inevitable - and Publishers Weekly got there first. "Phoenix Rises to Replace The Book Rack," the venerable industry publication trumpeted on September 25. Its 300-word article testifies to the fact that, with well-loved indie bookstores closing all over the country, the arrival of each new one is an event. DeSanto and Reiner are no strangers to the business. They owned The Book Rack & Children's Pages from 1995, when the store was still located in Winooski's Champlain Mill, to 2003, when they sold it to then-Assistant Manager Elaine Sopchak. Sopchak closed the store last March and has been providing marketing assistance to a number of local authors, including Howard Frank Mosher, Marjorie Ryerson and Rusty DeWees. She and Newfane writer Archer Mayor have formed a publishing company that is in the process of re-releasing Mayor's first 12 books of detective fiction. The Book Rack's demise left greater Burlington with only one sizeable independent seller of new books: The Flying Pig in Shelburne. Since selling The Book Rack, DeSanto says in a phone interview, he's turned his efforts outside the literary realm, coaching competitive runners and "dabbl[ing] in an art gallery that didn't make it. It never occurred to me to go back into books," he continues. "But with the closing of The Book Rack, we decided that would be the way to go. I can only report anecdotally, but we had heard that the people in the community were really missing it. I think there's a tendency in life today not to really treasure what we have until we don't have it anymore." But a new store also meant a new business strategy. DeSanto says he made a conscious decision not to replicate the family-focused Book Rack. Instead the store will aim at a demographic he thinks may be under-served: "baby boomers" aged 40 to 65. To appeal to a more metropolitan crowd, Phoenix will not have a "cottage-y kind of grandmother atmosphere," as DeSanto puts it. Instead, the store will have a café that serves espresso drinks, juices, teas and wine - "no soda!" he specifies. Nearby Sweet Clover Market will provide light, "tapas-style" fare. DeSanto told Publishers Weekly, "We will be a community bookstore." How that will look is still "a work in progress," he explains to Seven Days, but one component is a lively program of readings and events. He likes the idea of bringing in "authors involved in public discussion of issues today," creating a public forum similar to The New York Times' speaker series TimesTalks. "I want people to see the store as a place where they can go and talk and eat and issues will be alive inside the store," DeSanto says. Phoenix Books is located in the Essex Shoppes and Cinema between Carter's and Vermont Toy and Hobby. The owners plan a soft opening next Saturday and an open house on Saturday, October 20, from 4 to 8 p.m. with samples of their offerings of food and wine.